This insect is a locally important pest of currant and gooseberry. Heavily infested bushes are weakened and often become festooned by masses of white, flocculent 'wool'; the insects also excrete considerable quantities of honey-dew, upon which sooty moulds develop. Fig. 197 Brown scale, Parthenolecanium corni: first-instar nymph (xlOO). female then dies. Eggs, often up to a thousand in each ovisac, hatch from June onwards. The young nymphs then swarm over the foodplant and eventually settle on the 1-year-old wood. Here they begin feeding and, after passing through three instars, reach the adult stage, usually in September or October. After mating, the short-lived males die. 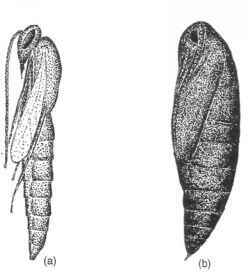 Female scale up to 6 mm long, dark brown, oval, convex with a distinct posterior cleft. Nymph pale greyish-brown to brownish-orange, flat and oval with a distinct posterior cleft. Male scale lmm long, whitish, boat-shaped. Adult male lmm long, mainly pinkish; legs and antennae brownish; forewings broad; caudal filaments very long.